This week, Your News to Know rounds up the latest stories involving precious metals and the overall economy. Stories include: U.S. dollar weakness to drive gold and silver prices in 2019, silver is a promising investment in 2019, and explorers are searching for rare gold coins from the SS North Carolina wreck. In their latest report on commodity prices, French bank Natixis outlined why precious metals have a strong couple of years ahead of them as the U.S. economy slows. According to an article on Kitco, the report states that after a remarkable year, the dollar will finally begin to trend lower as the Fed puts the brakes on its tightening cycle. Natixis’ senior commodities analyst Bernard Dahdah said that gold will benefit from a disappointing macroeconomic picture, one that includes capped employment and exhausted growth. The European Central Bank, along with several other central banks, is planning to roll out its own rate-hiking cycle in the second half of 2019, which should weaken the dollar further. According to Kitco, the yellow metal also stands to benefit from disappointing supply as mining forecasts point to less and less ore being found in the next two years. Likewise, the looming trade war between the U.S. and China could reach new depths due to China’s economic slowdown. As Dahdah notes, the latter’s inclination to avoid a crisis at any cost could have concerning implications for the global economy. 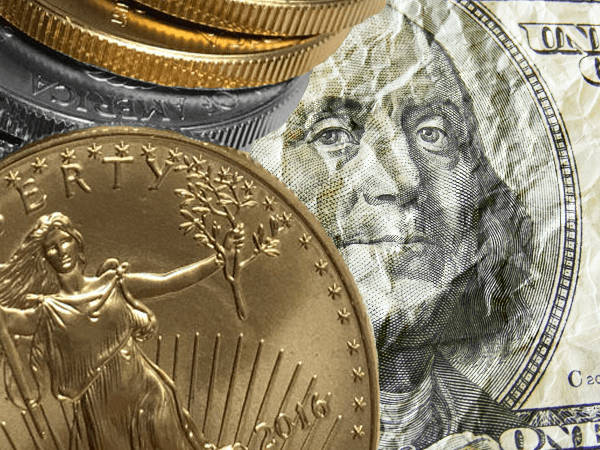 With risks on the horizon and an expected period of stagnation in the U.S., Natixis sees gold averaging $1,270 an ounce in 2019 followed by a move to the $1,300 range in 2020. Silver’s prospects are likewise exciting, as the bank predicts the metal to average $16.50 an ounce in 2019 and $17.30 an ounce in 2020. Gold and silver have held up admirably this year despite having to contend with a myriad of headwinds including rising rates, a stronger dollar, and a plummeting yuan, reports Commodity Trade Mantra. Silver, in particular, was also weighed down by the threat of a U.S.-China trade war which could diminish the metal’s industrial prospects. Bart Melek, head of commodity strategy at TDS, thinks both precious metals are set to recapture their losses in 2019. Melek sees gold prices reaching $1,350 next year, driven by diversification and haven demand as equities continue their plunge after correcting nearly 7% in October. The bank is optimistic on the global economy in 2019, predicting a growth of 3.5% in 2019 which could bolster silver’s industrial demand. Silver prices will also appreciate due to lackluster supply with a dearth of exploration prospects, said the analyst, who expects the metal to reach $17 an ounce next year. Seeking Alpha’s Hubert Moolman draws similar conclusions in regards to silver, stating that the metal is nearing the end of a bottoming pattern similar to the one between 2001 and 2003. Moolman notes that this bearish run paved the way for several years of price gains leading up to 2011, adding that the same scenario likely lies ahead as the dollar’s rally draws to a close. The sinking of the SS North Carolina is a maritime story shrouded in mystery. 178 years ago, the steamship was struck sideways by another vessel off the coast of South Carolina after changing course for unclear reasons and quickly went underwater. But according to the Charlotte Observer, it is the North Carolina’s cargo that truly has explorers’ imagination piqued. The ship carried a number of affluent passengers, none of whom had time to pack their belongings before evacuating the doomed vessel. Among them was a businessman who was said to have a bag holding 20,000 gold coins, which still have not been retrieved. The two companies have already recovered five hundred gold and silver coins from another Carolinas wreck, the Pulaski, with Webb stating that some of the U.S. gold coins were among the rarest ever found on a shipwreck. Various divers have made off with small amounts of plunder from the North Carolina wreck over the years. A notable discovery happened in 1996, when 18 U.S. gold Quarter Eagles, half-dollar denomination coins and two ornate gold pocket watches were recovered from the ship. Blue Water Ventures and Endurance Exploration Group are hoping for a bigger prize when they begin combing through the area over the next few weeks. Webb added that the bulk of the discoveries will likely happen during the traditional diving season in May or June.